After a long and unstable year, I have finally thrown in the towel, and have forsaken prescription retinol. Why? Well, after 6+ months with my esthetician, 90% of the time while on adapalene, my last visit was the first time she complimented me on the softness and clarity of my skin -- I was only a month into using the Exuviance by Neostrata system. 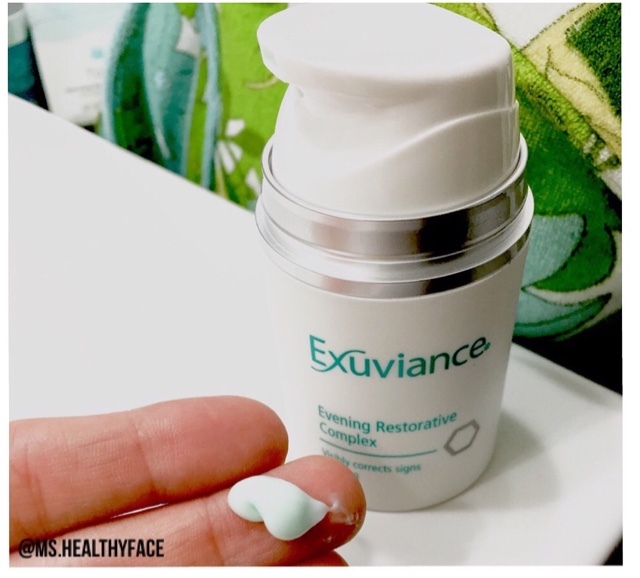 I won Exuviance's Evening Restorative Complex in the #sleeponit Twitter giveaway. Exuviance was kind enough to send the Complex along with a travel-size Purifying Cleansing Gel, and sample size of the daily moisturizer. 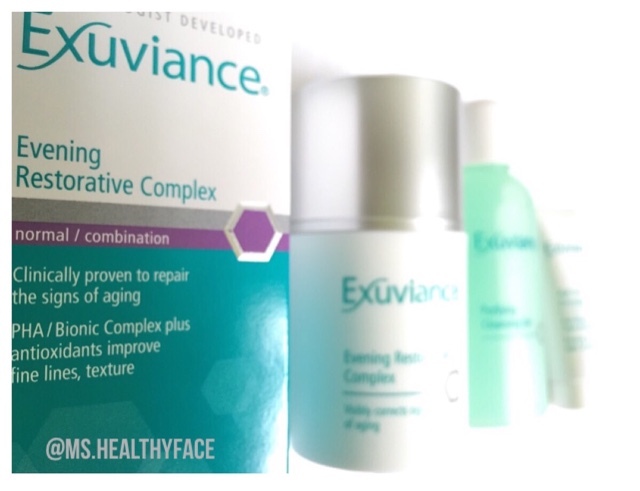 At first glance of the packaging, I did not think much of Exuviance's capabilities. Honestly, the Exuviance packaging/labeling reminds me of generic skincare systems sold in a dermatologists' office or day spa. You know, where the dermatologist or day spa partners with some skincare distributor, and then, they just put their own customized label on it and sell it. I have bought those skincare sets before and have not been impressed. I was also hesitant to try the Restorative Complex because I was still on my retinol regimen at night, and it is not suggested to mix a retinoid with other chemical exfoliants like AHAs and BHAs (the Restorative Cream uses AHAs and PHAs). I finally decided to try the Restorative Complex after doing a little research and discovering that it was packed with AHAs and PHAs. (PHAs are the modern-day AHAs, but are supposed to work better with sensitive skin types and cause less adverse reactions.) You only need a pea-sized amount for your entire face each night, so the bottle will last a while. It is lightly fragranced, but does not linger. There's no tingly either. It feels like a light moisturizer that dried within 5 minutes. If you have dry skin, you can layer another moisturizer over. I enjoy the gentle yet effective gel cleanser, too. It is pretty concentrated because I find that a little goes a long way. You only need half a pea-size to clean your entire face. Using it twice a day for the past couple months, I have not even made it past halfway of the travel size bottle. It's not stripping or drying, but still includes the benefits of AHAs and PHAs. The daily moisturizer is also really nice, but if I had to choose only one to get, I would definitely pick up the Restorative Complex. 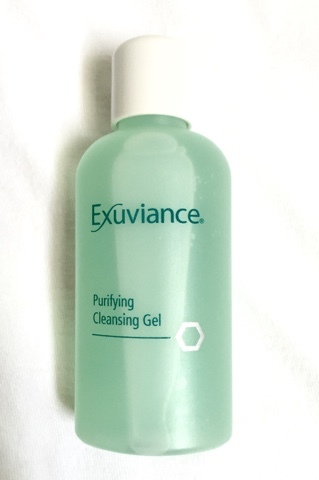 I have been using Exuviance's Restorative Complex, daily moisturizer, and gel cleanser for a couple months now. My skin has never look clearer or felt softer. I haven't had any scarring cystic acne breakouts. Even around that time of the month, when I am more prone to acne, pimples that attempt to form are gone by the next day. Looking back at this past year, I feel that my adult acne is definitely caused by my skin's slowing rate of natural exfoliation -- due to aging (I am almost 30). I am so happy I finally found a chemical exfoliant/system that helps regulate my skin renewal rate. I've been getting so many compliments on my skin, even from strangers! I tell everyone about Exuviance. I have pulled out my phone a dozen times to show people the spelling. I love how accessible it is, too! Available at Ulta for $48 and on Amazon $38! P.S. Ulta has gift sets available/gifts with Exuviance purchases every now and then. I would definitely aim to show during those times. That way, you can try the whole system. Highly HIGHLY recommended!! !